Thanks....I guess I just like em! Aww, I love it, mostly the sails I like about it, and the sea. Thanks Joyce.. 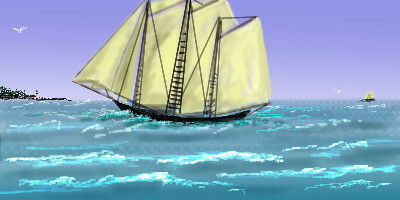 I do these when I'm playin around...no refs..just for fun..
Lovely clipper ship that you do so well. Yeah, it's a new kind of submarine with sails. Not there silly, Dave'll knw what I mean. So you're not talking about the small ship in the distance on the horizon to the right? No, it's a personal thing, I once asked Dave to recreate a picture he did on doodle draw where he drew a submarine attacking a clipper ship, but so far he hasn't. But maybe he'll take this hint.